← Can Online Games Solve Science Questions? Interested in open source software? 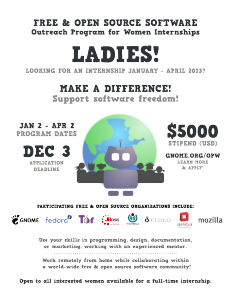 Consider applying for the FOSS Outreach Program for Women. This program offers $5000 for 3 months of remote work on a specific software project. Projects include Mozilla, OpenStack, Fedora and more. This initiative is organized by the Gnome Foundation and supported by the Wikimedia Foundation. Further information is available on either site but act quickly as the deadline for applications is December 3. Morelli, R., Danner, N., De Lanerolle, T.R., Ellis, H.C., Izmirli, O., & … Parker, G. (2009). Revitalizing Computing Education Through Free and Open Source Software for Humanity. Communications Of The ACM, 52(8), 67-75. Rashid, R. (2008). Inspiring a New Generation of Computer Scientists. Communications Of The ACM, 51(7), 33-34. Wallace, P. (2007). Using Collaboration to Provide Students with an Internship Experience in an Information Systems Course. Journal Of Information Systems Education, 18(2), 145-148. This entry was posted in Computer Science, For Graduate Students, For Students, Uncategorized and tagged Computer Science, internship. Bookmark the permalink.